A Balanced Budget. A balanced budget does quite a few things. It reduces the size of government. That means more people producing goods and services and less people telling other people what to do. It means less inflation. Inflation is a hidden tax that hurts the poorest among us by robbing them of their savings and increasing the cost of the things they buy. And once their incomes finally catch up with inflation, they are put in a higher tax bracket reducing their purchasing power even more. A balanced budget strengthens our currency. It means we will be a haven for foreign investment because people will know we are not destroying the value of our money through poor fiscal policy. And finally, it will reduce corruption as it will limit the ability of questionable politicians from wielding “government investment.” With less money to throw around, politicians will have to win elections the old fashioned way, by doing what they are supposed to do…..represent their constituents. Free Market Principles. We need to get back to the idea what “A” sells “B” has nothing to do with “C” or “D” or anyone else out there. We vote everyday with our pocket books. By who we choose to do business with and by who we choose not to do business with. But just because I choose not to do business with certain companies due to my own beliefs, it does not mean I have the right to prevent you from doing business with them. Nor should government have a right to impose excessive taxes, fees and regulations om a businesses or industry because someone in Washington D.C. has “an axe to grind.” We talk about freedom, and freedom of choice is one of this country’s basic principles. But we have an over reaching federal government that involves itself far too much into our day to day lives. The government gives aid, low interest loans and tax breaks to private companies under the guise of “Government Investment.” We do not pay taxes for politicians to play investment banker. Investment should come from the private sector, and not from tax dollars. Plus government involvement in the economy rarely helps the consumer. Most often it penalizes them through higher taxes, higher prices, and reduced choices. This creeping socialism and/or crony capitalism is what causes most of the grief in our economy and our lives. If government was to stay out, the free market would flourish and expand though continued innovation creating better lives for all Americans. School Choice. We use the free market system everyday to give us choices. And competition in the market is constantly pushing businesses to provide better service, better products, and better prices. Yet our schools use a system of geography where choice is based upon where you live, not what you want. This lack of competition often creates mediocrity, reducing the value to the student and tax payer and prevents true choice when it comes to education. In cases of funding, it often defies logic. For example, the schools that report the poorest test scores often get increased financial assistance through grants and additional tax dollars. While those schools that meet or exceed standards find themselves with a shrinking budget. In other words, we give incentive for failure and penalize success. How is this fair? But imagine if we had school choice. Where students are not bound by imaginary boundaries drawn up by a school board, but where the could choose the school that best fits their beliefs and goals. Where the schools would have to to compete for your voucher (tax dollars). They would do this by providing better instruction, more engaging classrooms, all while attempting to keep costs down to create a better value for the student and tax paying public. This idea would greatly improve the options among poor communities as they would have the opportunity to go to schools that consistently do better than their own. It would also force underachieving schools to improve, or force them to put up a banner that reads “under new management.” We must raise the bar in regards to education and it begins with School Choice. Strong Military. Teddy Roosevelt said, “Speak Softly, and Carry a Big Stick.” Ronald Reagan believed in “Peace through Strength.” Both believed in the basic idea that a strong military is the best way to deter conflict. I am a firm believer in that policy as well. We need to accept the responsibility that the United States is the world leader and it needs to start acting like one again. States Rights. The 10th Amendment (Part of the Bill of Rights) states: “The powers not delegated to the United States by the Constitution, nor prohibited by it to the States, are reserved to the States respectively, or to the people.” Such a simple and well written law to restrict the size and reach of the Federal Government. Yet many people feel the law fails to be strong enough. I disagree. I feel our lawmakers fail to acknowledge the rule because it gets in the way of the Federal Bureaucracy. Many of our Senators and Representatives have come to the conclusion that this is no longer a government for the people, but a government for the government. This needs to change. The states and the people need to assert their rights and restrict those in government who attempt to further the erosion of the 10th Amendment. These are some of the reasons why I am running for Oregon’s First Congressional District. 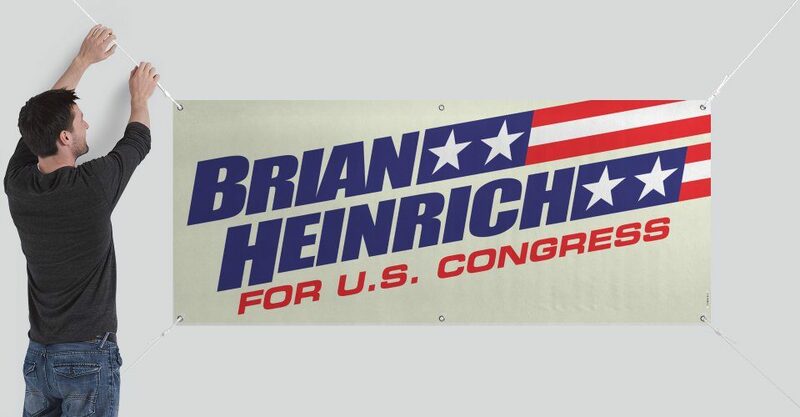 This is also the reason why I am “Heinrich for Oregon” and not Heinrich for Congress. My loyalty is to the people of this great state and not to those with offices in Washington DC. I thank you for your time. Because I am running this campaign with no financial support, I appreciate it if you would share my thoughts and ideas through your own social media accounts (facebook and twitter) as well as tell your friends and neighbors about my campaign. My success is in your hands. Thank you.